The Ninth Judicial District Commission on Judicial Performance unanimously recommends by a vote of 10-0 that Judge John Fowler Neiley BE RETAINED. Judge Neiley was appointed as a district court judge in June 2013. Judge Neiley earned a bachelor’s degree from the University of Colorado in 1981 and a J.D. from the University of Colorado School of Law in 1987. Prior to his appointment to the bench, Judge Neiley had a civil litigation and real estate/land use practice in Glenwood Springs. Additional experience includes medical malpractice defense, insurance defense, enforcement of Federal Trade Commission consumer protection laws and enforcement of antitrust laws. 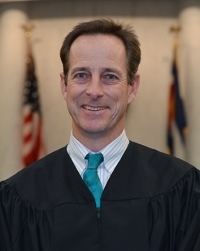 Since his appointment, Judge Neiley has been an active participant in community service activities, including the Ninth Judicial Access to Justice Committee, the Colorado Bar Association Mock Trial Committee and the Colorado High School Mock Trial Program. The Commission conducted a personal interview with Judge Neiley, evaluated three opinions he wrote, observed him in court, considered comments received from interested parties during the evaluation, and reviewed survey responses from attorneys and non-attorneys who had experience with Judge Neiley. Among the survey questions was “how strongly do you recommend Judge Neiley be retained in office, or not be retained in office?” Of attorneys completing the survey, 100% recommended retention. Of non-attorneys completing the survey, 73% recommended retention, 23% not to retain and 4% expressed no opinion. (These percentages might not total 100% due to rounding.) A total of 53 attorneys and non-attorneys completed judicial performance surveys regarding Judge Neiley this evaluation. Judge Neiley has presided over civil and criminal matters in his first term, including Drug Court, which provides for frequent review and intervention by the judge in order to allow criminal defendants with severe drug and alcohol addictions an opportunity to take advantage of treatment options in lieu of incarceration. Through survey results, Judge Neiley received mostly positive comments and consistently high marks in case management, application and knowledge of law, communication, and demeanor. His overall combined rating of 3.52 exceeds the combined rating of all district judges standing for retention. Consistent with survey comments and results, Commission members observed that Judge Neiley works hard to ensure that every person who appears before him is treated respectfully and has the opportunity to be heard. He occupies the bench as a true public jurist—a judge who not only performs his duties at the highest level, but also fundamentally believes that his role is one of public and community service.